Is Pluto a planet or not? Pluto was declassified as a planet by the International Astronomical Union (IAU), in the year 2006. The planet is in orbit around the Sun. The planet has sufficient mass to assume hydrostatic equilibrium (a nearly round shape). The planet has "cleared the neighborhood" around its orbit. Apparently, Pluto satisfied the first two conditions, but fell short in the third condition. That is, for Pluto to retain its status as a planet, it had to first eliminate all the surrounding bodies occupying its orbit. However, astronomers noticed that it hadn’t done so, as there were many objects around it and some of them were even equal or to its size or larger than it. The fact that Pluto hadn’t cleared its orbit was made even more obvious by the discovery of Xena (UB 313), a celestial body in Pluto’s orbit and larger than Pluto itself. 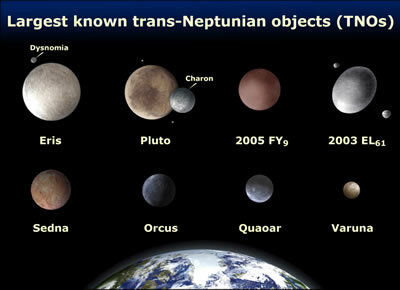 Apart from the UB313, other celestial bodies, known as Plutoids or trans-Neptunian objects (TNOs), were also evident to astronomers studying Pluto. Some of the other prominent Plutoids that share Pluto’s orbit are: Sedna, Quaoar, 2003 EL61, and 2005 FY9. All these bodies lying in Pluto’s oval orbit are known as the Kuiper belt objects, and the section of the orbit where all of them fall under is known as the Kuiper belt. Therefore, the above is the reason why Pluto is no longer considered as a planet.